Tomorrow, December 7th, 2013, marks the 72nd anniversary of the Attack on Pearl Harbor. On that day in 1941, Japanese bombers and other aircraft launched a surprise attack on the U.S.’s Pearl Harbor naval base on Hawaii’s Oahu island. The attack left nearly 2,500 dead and over 1,000 wounded. In addition it destroyed hundreds of American ships and aircraft and launched the United States into World War II. Congress and President Franklin D. Roosevelt declared war on the Japanese the following day. 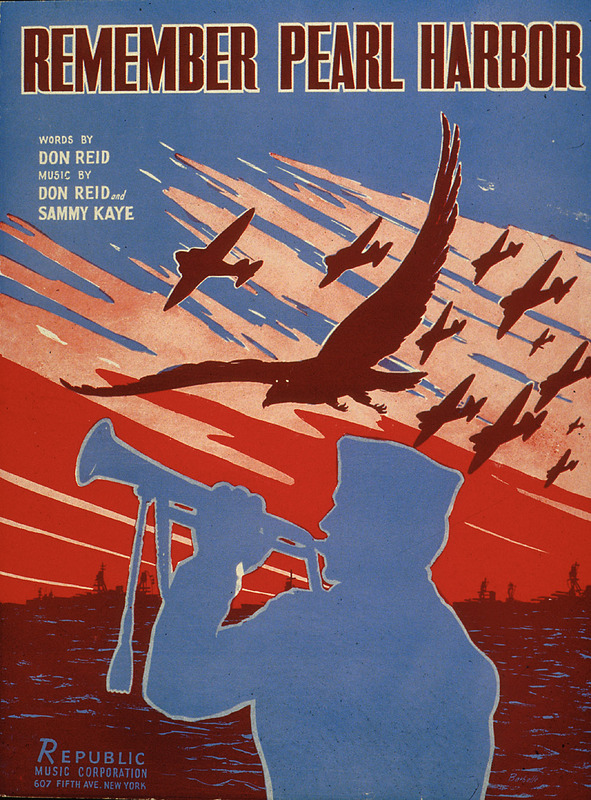 “Remember Pearl Harbor” sheet music from the National Air and Space Museum Library. By Don Reid and Sammy Kaye. Published by the Republic Music Corp, 1941. This sheet music cover from the Bella C. Landauer Collection in the National Air and Space Museum Library harkens to the days immediately following the attack when “Remember Pearl Harbor” was a rallying cry around the country used to garner support for the war. 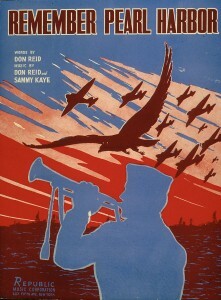 Sheet music, and their illustrated covers like this, often offer valuable insight to attitudes and emotions of the time. The National Air and Space Museum Library also holds a complete series of the 1946 Congressional hearings on the attack, a valuable tool for researchers. The National Museum of American History Library has many Pearl Harbor related items in its collection as well. Read more about the attack and the U.S.’s involvement in World War II and other wars in the interactive exhibit “The Price of Freedom: Americans at War”, from the Smithsonian’s National Museum of American History. Through Collections Search Center, you can also browse hundreds of related items from across the Smithsonian. “A date which will live in infamy” is how President Roosevelt described December 7th, 1941 in his speech to Congress the following day. The entire typed speech can be read on the National Archives website. Previous Post Support the Libraries with your holiday shopping!